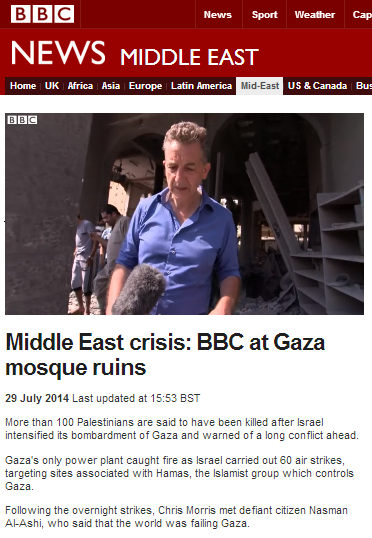 On July 29th a filmed report by Chris Morris which appeared on BBC television news was also posted on the BBC News website’s Middle East page under the title “Middle East crisis: BBC at Gaza mosque ruins“. Morris does not provide us with the name or precise location of the mosque from which he reports and so it is impossible to check the circumstances of his story. He does, however, take care to stress no fewer than three times that mosques are being “targeted” in Gaza – but makes no attempt to explain to audiences why that might be the case. The film below – showing the entrances to Hamas tunnels located inside a mosque – provides the type of context which Morris conceals from BBC viewers. Mosques have also been found to be storing weapons, missiles and explosives. Interestingly, this theme of a supposed rise in the popularity of Hamas is being found more and more in BBC reporting from the Gaza Strip in recent days. What BBC audiences have not seen, however, is any BBC investigation into reports of summary executions carried out by Hamas of people deemed ‘collaborators’ or any attempt to interview people who do not support Hamas. The obvious antisemitic undertones of that comment echo another interview done by the BBC’s Paul Adams earlier on in the month in which the interviewee used a Nazi analogy. The name of that interviewee was Basman Al Ashi and he was presented as the director of Wafa hospital. Michigan-trained Dr Basman Al Ashi has been appearing quite a lot in the Western ‘progressive’ media and blogs lately, not infrequently in efforts to try to spin the fact that after Paul Adams’ interview with him (during which Adams stressed that “Israel says rockets have been fired from Basman al-Ashi’s hospital, a charge his staff deny completely”), the hospital under his directorship was found to house the entrance to a Hamas attack tunnel leading into Israeli territory and was also used as a Hamas command and control centre, a weapons storage site, a missile launching site and a sniper post. 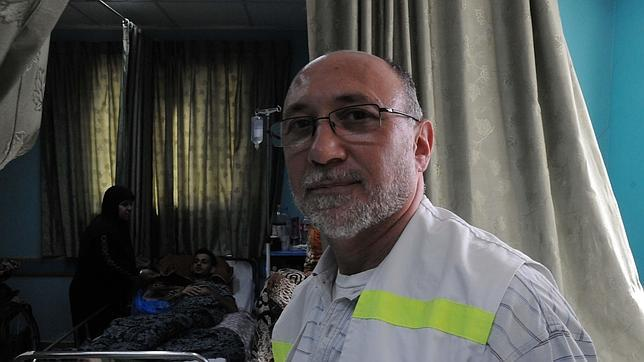 Here is a picture of Dr Basman Al Ashi in his hospital. Unless, several decades ago, Mrs Al Ashi gave birth to identical twin boys and named them Nasman and Basman, it would appear that Chris Morris’ “defiant citizen” – whom he implies in his introduction is one of the people in Gaza who “don’t support Hamas” – is actually none other than the man who allowed Hamas to spend years digging a tunnel from the hospital under his authority and to turn it into a military facility – and who is now busy giving interviews in an effort to cover up that blatant use of helpless patients as human shields. 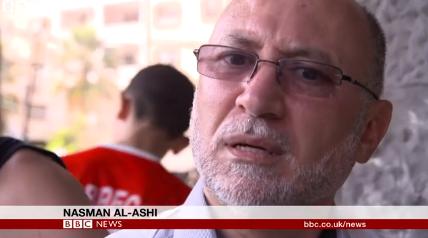 If that is the case, then obviously the BBC has some serious questions to answer regarding the misrepresentation of Dr Al Ashi as an ordinary man in the street. It would also be interesting to know how Morris met Mr Al Ashi in the first place. Were his interview services provided to the BBC by a local stringer or by Hamas itself? Why did the BBC not notice that it had interviewed the same man under a different name and description only eleven days earlier? Or – if the BBC was aware of Al Ashi’s identity – why did Morris not take the opportunity to tell BBC audiences what really happened at Wafa hospital and to correct at long last the obviously inaccurate and misleading report put out by Paul Adams? And why did Morris not question Al Ashi about his distinctly unprofessional collaboration with Hamas in turning his severely disabled patients into human shields? Finally, of course, there is the not insignificant matter of the now repeated failure to edit out antisemitic remarks in BBC interviews; an issue which also clearly requires some very urgent answers.